Now based on the Sunshine Coast in Queensland, Angela started her career in South Australia where she grew up in Mount Gambier before moving to Adelaide in her early teens. 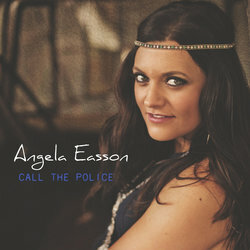 Since releasing her debut album Wanted in 2015, Angela has had four singles from her album in the National Country Tracks Chart top 30 with her first single “Once Upon A Time” reaching #13. Her video clips have been played on CMC and her songs can be heard nationally on Australian radio. She has toured nationally twice and played at some of Australia’s major country music festival’s including Deni Ute Muster, Mildura Country Music Festival, Norfolk Island Country Music Festival and Tamworth Country Music Festival. Her accolades over the past decade have included being awarded the 2010 Trans Tasman Entertainer of the Year, 2011 Starmaker Finalist, CMAA Country Music Academy Senior Graduate and in 2015 she was the Brand New Star winner awarded by radio station Todays Country 94.1FM. The first track from the album Call The Police was cowritten with Golden Guitar winner Kevin Bennett. This power alt country tune was written on a songwriting retreat and the lyrics show how this young songwriter has grown immensely.